It’s no secret that I’m a true loyalist of the Club ITC Culinaire membership of the ITC Hotels. For business savings or personal spends, the membership’s got your back. My recent saving with the card was during an office party I hosted. My boss had decided to start a new innings in her career after completing 20 glorious years with our company. It was only befitting to host a dinner honouring her contribution to the company. I invited a group of 25 of her closest associates for cocktails and dinner at K&K at the ITC Grand Central in Mumbai. At K&K, show kitchens visible from all corners of the dining area are the highlights where the sights and smells of cooking easily entice your senses. Our farewell bash was a sit down dinner with a pre-set menu consisting delighful kebabs, curries and biryanis. Saboot Tandoori Aloo, Dal Bukhara and Tarkari Pulao were the winners with our group. I foot a bill of Rs. 1,80,000 for a gathering of 25 people. Club ITC Culinaire got me 45,000 Points which amounts for 25% of the total bill amount. These points are enough to cover my cost for the next 5 visits to the hotel. I might even sneak in a room night stay with my family over a long weekend at 6,000 Points for a room night stay. It’s a rewarding feeling to think about your savings from one dinner covering the cost of your next 5 visits. I constantly jet set around the country and the region for work. Even though business travel is just a part of the grind for most people, it is something I’m extremely meticulous about. My travels over the past few years have taught me that choosing the right loyalty card is a crucial task on your way to start reaping the rewards from extensive dining and stays at hotels. For anybody who stays at hotels for extended periods of time, it only makes sense to get rewarded for the same. I chose the Taj Hotels as it provides me access to a collection of exquisite properties across the region. My normal stops are mostly large Indian cities like Delhi and Mumbai. There is a Taj property in each of these places and they really look after their guests. The Epicure membership comes with great perks like a complimentary night stay (which I use for my holiday) and point earning and redemption over food, drinks and the spa. 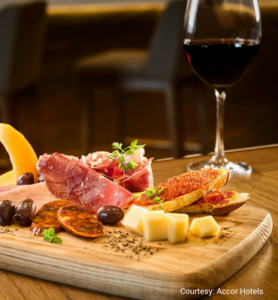 Added to the 25% Epicure point earning on food, the membership offers Happy Hours at the Bars all days of the week. When I travel alone, I do tend to use the Happy Hours offer often. The best bit is that I meet other single travellers and many use the Epicure membership for the Happy Hours too. It’s a super benefit. I accumulate enough Epicure Points and Airline miles due to my incessant travel that I can treat my family to two holidays a year at almost no cost. The Epicure Points take care of the stay and the earned miles take care of our travel. The Epicure membership comes with great perks like a complimentary night stay (which I use for my holiday) and point earning and redemption over food, drinks and the spa. The annual membership price is recovered by the use of the free room night and the 50% Point earning for the 1st three transactions alone. I’d recommend the membership to anyone with a penchant for travel and entertainment. It works well to reward your family and make up for the time spent away with some wonderful memories at the Taj, all earned through redemption of Points. The Taj has a wonderful set of experiences you can redeem your Points for. If you’re interested to know more, you can log on to the Taj website for a detailed view on their Point earning and redemption system. I’m a 40 year old professional working as a Partner with a Big Four accounting firm and I’m a huge advocate of networking through business entertainment. This is not just a business need but also a great way to build a relationship with clients or prospective clients. With my fair share of experience in entertaining clients for business, I have slowly discovered that points based loyalty cards are just perfect. One earns points each time you entertain someone just like you earn miles when you fly on business. Once I have enough points, I redeem them to take my family out for a meal at no cost or for a quick vacation paid for by my points. The best part is the 6000 preloaded points that come with the card when buying or renewing the membership. Off all the dining options available at ITC Hotels, their Indian food is my weakness, hence I’m a regular at Bukhara and Dum Pukht. I earlier had the ITC discount based membership and was very disappointed when they switched to the points program. Due to my love for the food, I got myself a Club ITC Culinaire membership anyway and discovered the wonderful benefits of the points based programs. 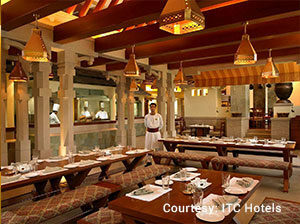 I earn points while dining and also when I stay at the ITC hotels during my travels across the country. You can’t even believe how quickly these points add up. The best part is the 6000 preloaded points that come with the card when buying or renewing the membership. My wife and I go to celebrate by redeeming these points for a one night stay at ITC Maurya at no cost, virtually recovering my investment in the annual fee and the night stay is only the beginning of the point earning journey. Let me tell you an incident in particular to explain how wonderful this membership is. Last year I spent about Rs. 80,000 on dining and entertainment and about Rs. 1 lakh on my stay bills for which I earned a total of 25,000 Green Points, 25% on dining (20,000 points) and 5,000 points on stay. I used these points for a 2-night getaway with my family to Agra at the wonderful ITC Mughal and 3 nights at ITC Rajputana, the charming ITC hotel in Jaipur, using up 5000 points per night. Folks, there are some more benefits like special room rates, discounts on welcome break, birthday bonuses and more. It works all round. Go enroll and enjoy the point earning opportunity. Connoisseur Club for connoisseurs of a good lifestyle! The Leela has a range of award-winning properties that celebrate the country’s diverse geography and rich architectural history. Their luxury palaces, hotels and resorts are present in Mumbai, Bengaluru, Kovalam, Gurugram, Delhi and India’s magical holiday destinations of Goa and Udaipur. 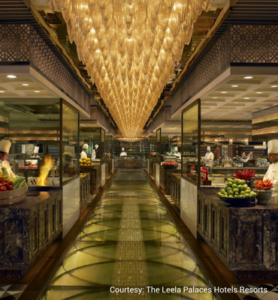 In many ways, The Leela has redefined gourmet food, luxurious stays and indulgent living. Hand crafted menus across restaurants at Leela hotels spell culinary excellence. 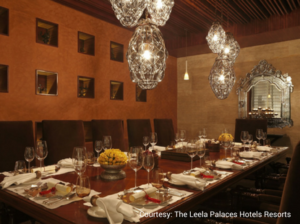 With a selection of restaurants like Jamavar, The Great Wall, Citrus, Spectra and others, The Leela offers the best in dining. While Jamavar brings royal culinary traditions to the city, Spectra and Citrus bring to you the best of global cuisine. Connoisseur Club offers undeniably good discounts on food and drinks, up to a 50% off on dining and a 15% on beverages across the hotels. My company got for me and some of my colleagues a Connoisseur Club membership as we were regular visitors to the corporate hubs of Delhi, Mumbai and Bengaluru. The company felt that using the membership would lead to corporate savings on dining and living and indeed it did! Connoisseur Club offers undeniably good discounts on food and drinks, up to a 50% off on dining and a 15% on beverages across the hotels in these three business hubs. More so, each time I booked my hotel room, I got a discount on the Best Available Rate on accommodation. Group dining certificates and others added to a reduction in our business expense as well. The best part was that the membership came with a free room night stay in my city, which of course I could use as a personal gift from the company. I took advantage of the same to go stay at The Leela in Gurugram with my family. During our stay we conveniently shopped at the adjoining Ambience Mall and later dined at some of the finest restaurants in Gurugram at The Leela. Skimming through the vouchers made me notice the discounts offered on lifestyle services and got me to try the Spa which was truly rejuvenating. This membership really indulges you to experience the magnificence of the Leela hotels. The membership also comes with a spouse card at no extra charge. If you’re a fan of beautiful locations and world class service at a reasonable value, go ahead and get this membership or try your luck and nudge your company to get one for you. I have always wanted to pamper my parents, how they pampered us, if not always, at least on the big day, their Anniversary!! I never felt satisfied with what I’ve gifted them because it’s no different from what I do usually, as the options are limited to conventional gifts like flowers, cards or dinners. I was looking for the perfect gift which would truly surprise and overwhelm my parents and that’s when my friend suggested the Connoisseur Club membership from The Leela Palace Bengaluru where she’s a member. She recommended Connoisseur Club by saying that “It’s a complete package worth every penny”. I quickly researched the Connoisseur Club membership and I have to say it was an ideal gift for my parents and they could do all they ever wanted with the membership. The Platinum Level membership caught my attention in particular, I felt like it was crafted just for my needs. Off all the variants the membership offered, Platinum Level was the most indulgent and high value membership. The membership kit arrived at my doorstep within a few days, ready to be gifted to my parents. My membership was so well packaged that it exuded elegance and class, it was perfect to be gifted as it is. It’s a delight to hear my parents talk about The Leela Palace Bengaluru and their savings courtesy Connoisseur Club. My parents’ most recent experience with Connoisseur Club is their two night stay in a suite at The Leela Palace Bengaluru. They were immensely impressed with the hotel façade drawing inspiration from the architectural style of the Royal Palace of Mysore, and exclusive access to the Club Lounge, which enabled them to enjoy multiple rounds of drinks and snacks at the Club Lounge and exploit their taste for whiskey sour each evening they stayed at the hotel. On their second day at the hotel, we invited friends and family to surprise them, we were a total of 8 people on a table at Zen, the Pan Asian restaurant and guess what, just because my parent’s were now members we got a 50% discount over a sumptuous brunch with alcohol. A discount of this capacity was almost unheard of to most of us on that table! My parents were very pleased and said this was one of the best experiences of their life. I totally agree with them, they did all that they wanted to do immersed in royalty and luxury while saving big bucks. I’m sure that they’ve already managed to save INR 30,000 or more due to this membership. Since it’s a year long membership, we look forward to visit The Leela Palace Bengaluru again and again to experience it all! This is just the beginning; I would love to try the other Leela properties too. Club ITC Culinaire for the gourmet aficionado! 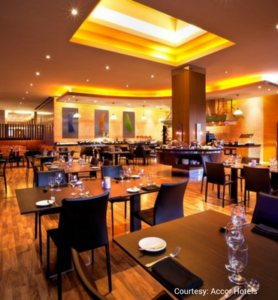 I was on a hunt for the perfect birthday present for my husband when my friend suggested the Club ITC Culinaire membership to me, keeping in mind his absolutely irrevocable love for food and all things good in life. It was his big 50th, I knew the gift had to be special, but a hotel membership is something I was really unsure of only because I had never heard of anything like it before. However, one look at their online brochure was enough for me to make a decision and buy the membership. ITC has the most beautiful properties across the country. From ITC Maurya nestled in greenery in the heart of Delhi to the very royal ITC Rajputana in Jaipur, each property is worth a visit for the unique experience it has to offer. In addition to beautiful hotels, ITC Hotels are known to create handcrafted signature dining experiences at their iconic restaurants like Bukhara, Dum Pukht, Peshawari and others. 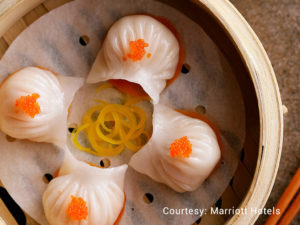 The restaurants known for their flavorful excellence offer the finest in food, service, ambience and culinary traditions. Club ITC Culinaire membership Green Points can be accumulated and redeemed on accommodation and lifestyle at over 100 hotels in 75 locations and 80 Wills Lifestyle stores. My husband absolutely loved the membership card and soon enough I knew that I had made the right choice. The welcome bonus of 6000 Green Points allowed us to redeem them for a one night stay at ITC Maurya to celebrate my husband’s 50th. The best part of the evening was that in addition to the 25% Green Points, we earned 50% bonus points on the entire bill as a part of the birthday week redemption and since our total expenditure crossed 25,000, we were credited with another 1,000 Points. On a bill of Rs 30,000 we had earned 12,250 points, which can now be used for 2 room night stays at ITC Maurya itself at 6000 points a room night. We had invited a few friends for dinner at Bukhara to celebrate the special occasion and enjoyed a very memorable meal as the restaurant never fails to impress. The best part of the evening was that in addition to the 25% Green Points, we earned 50% bonus points on the entire bill as a part of the birthday week redemption and since our total expenditure crossed 25,000, we were credited with another 1,000 Points. On a bill of Rs 30,000 we had earned 12,250 points, which can now be used for 2 room night stays at ITC Maurya itself at 6000 points a room night or at another similar ITC Hotel across India or a visit back to Bukhara for knocking off Rs 12,250 from our next bill. Even though the membership was a gift for my husband, the complimentary spouse card lets me enjoy the benefits too! Now I use my spouse card to redeem points every time I have a Kitty to attend or go out for a casual lunch or evening with my friends. 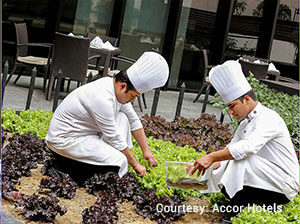 Club ITC Culinaire is a combination of a good deal and super experiences at an ITC Hotel. From 25% Green Points on dining, birthday week celebration bonus of 50% points (including the spouse birthday), to 5% earnings on your stay and on expenditure at Wills Lifestyle stores, the membership caters to all aspects of a distinguished lifestyle. 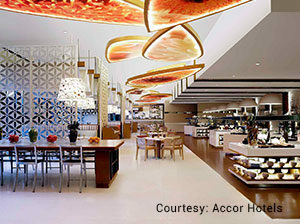 Perfect for connoisseurs of good food, fashion and experiences! Last month we had my brother and his family visit us from Mumbai. As they landed in Kolkata, we told them about the relaxing staycation we had planned for all of us at the Radisson Kolkata Ballygunge courtesy the Rezerved membership. The day we were to check in, everyone woke up excited with their plans ready for the weekend. The ladies had plans to hit the spa while the men planned to spend quality time with the kids within the indulgent abode that was our hotel. Radisson Kolkata Ballygunge is one of the most premium hotels in Kolkata with the best rooms in the city and good in-house food and beverage options. The hotel houses some of the best food options at the all day diner, K 19 and the cozy Smoke Shack which serves some very creative kebabs. We had booked two rooms since we were 2 families of 3 members each. Thanks to the Rezerved membership we got the first room complimentary and the second room at a special price of only Rs. 3000. The Rezerved benefits didn’t just end at accommodation. We were also able to redeem our meal certificates for a 50% discount on the food bill for a table of six over two meals during our stay. Not to forget, the women also got 20% discount at the Spa for their much awaited spa sessions. With young children it was inevitable to avoid room service every couple of hours to curb their hunger pangs. Luckily for us, Rezerved card discounts were applicable during all meal periods. Thanks to the Rezerved membership we got the first room complimentary and the second room at a special price of only Rs. 3000. Even though we exhausted most of our certificates, we plan to visit the hotel often enough to enjoy discounted meals and food promotions with the help of our card benefits. The card discounts offer up to a 50% discount at the restaurants depending on the number of guests. Rezerved managed to make our relaxing staycation absolutely memorable. We had the most gala time at almost half the cost of the original services. My brother was so impressed with the membership and its benefits that he plans to buys the same for himself. Retail therapy is the real deal for me and my standard stop is the Ambience Mall in the heart of Gurugram. On one of my shopping trips, I stepped into Spectra at The Leela Ambience Gurugram Hotel for lunch with a friend. We thoroughly enjoyed the extravagant buffet with a choice of cuisine for each. On my way out, I crossed paths with a Leela executive who told me about the Connoisseur Club membership. It seemed so attractive that I got it immediately and have never regretted it ever since. Now it is the most important card in my wallet, almost as important as my credit cards. The most attractive bit of the membership are the suite night stays built into the Platinum Level. You can use these one at a time and I have used up all the three certificates, enjoying the super luxury of a suite at the hotel, dining discounts at Spectra and the walk straight into the Ambience Mall. For the ones who don’t know, the hotel and the Mall are a part of the same complex. In addition to the dining and accommodation certificates, I ended up using the spa benefit of the membership at the hotel as well. Now it is the most important card in my wallet, almost as important as my credit cards. The membership has more to offer at the lovely Leela hotels in Udaipur, Goa or Kovalam and if you want a city experience then of course the stunning Leela Palace hotels at Bangalore and Chennai. What’s even better is that the card works for dining discounts at the Leela hotel in East Delhi as well, a place I end up going to every couple of months. Highly recommended if you wish to lift your lifestyle with The Leela Hotels.